The hydraulics on this tractor have been getting worse and then failed completely. The front loader had to be lifted up with a forklift (and then be proped up) in order to transport the tractor to the workshop. The surprise came when the top cover was unbolted and turned over, as the hydraulic cylinder was not fastened to the top cover as it should have been. You can see the pushrod in the photo below which should be connected to the cylinder. The casting of the hydraulic cylinder was broken, but Massey Ferguson did not have the part in stock and had no plans to manufacture any. After a few telephone calls we learned that Massey Ferguson had not stocked the part since 2002, although they do have the original 2″ cylinder available. The camera crew were able to get some good shots inside the transmission casing to show where all the components are situated. Lighting of the camera shots is a difficult job due to all the oil covered metalic parts which reflect the light straight back towards the camera lens. The lighting man managed to get things set up with several lights and filters held up in the roof of the workshop, where there was a plethora of gantries, ladders, pieces of wood and baler twine from the farm used to fasten it all together! Filming all the procedures slows things down a lot, but we soon had the pump out and on the bench. On the underside of the photo the yokes were found to be smashed, possibly by pieces of the broken top cover dropping down and getting jammed in the reciprocating pump mechanism. The pump components come to pieces in a matter of seconds. Now they can all be carefully assessed for wear and any other obvious problems before it is re-assembled. The control valve is a very precision piece of engineering, and central to the operation of the hydraulic system. Next we await the arrival of the replacement parts that are on order before the system can be repaired. The DVD is recording each step of the process in great detail. After watching the DVD it should be possible for everyone to understand how the system works and undertake the repair with competence. In order for the system to work smoothly and efficiently is is not just a case of replacing any worn parts. There are several set-up procedures and measurements to undertake to get the system working properly. This is the tractor back in action after the full hydraulic system rebuild. It can now easily lift a full scoop of earth with the fore-end-loader. One of the first tasks for the owner has been hay turning on his smallholding, and he can’t remember the tractor ever performing so well. Your DVD is eagerly awaited – I will be placing an order immediately it is available. I have a TED, 35 four cylinder & a 135 – I presume the basic principles will be the same for each tractor. With all of my tractors the lift arms drop down after they have been standing for a short time (even with no weight on the arms) – will the DVD cover this fault? The DVD will indeed cover this common fault. Those symptoms are a common result of wear throughout the system. The offending component is usually the control valve, but it could also be the hydraulic cylinder or any seal in the system. The fit of the control valve in the sealing washers is critical (0.0004?) and the washers should never be replaced without the valve itself been renewed. 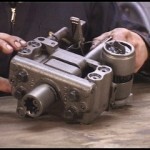 The DVD shows you what to look for and how to fit any required parts. We will be continuing with the filming as soon as the parts arrive. We’re getting lots of emails requesting the disc, so we’re working as fast as we can! When do you think this DVD will be available. How you planning on notifying folks when it is available? The pump repair kit has arrived today, so we’re now able to film the next section. We’re still waiting on the replacement hydraulic cylinder. The best estimate I can give is about 8 weeks. If people want notifying when the DVD is ready, then if they send in their details via the contact form I will email them when the time comes. I’d like to be notified when the hydraulicas DVD is available. If it was a mechanical problem with the idler gear (or any other mechanical part of the timing system / injection pump drive) then I suspect that the problem woud be constant and not just suddenly happen after 50 mins. I would have thought that it is a fuel problem, either air or dirt. It would probably pay you to remove the fuel tank and clean it, along with the outlet tap and change the fuel filter. It is possible that there is either a weak spring or a broken spring in the fuel lift pump, or dirt under one of the valves in the lift pump. If all the above are OK, then it is possible that air is entering the system through any joint. I strongly suspect that it is a fuel problem rather than a mechanical problem with the timing/injection drive, as the engine just wouldn’t run with one of these problems. It seems as though your problem is intermittent – usually means fuel/air problem. I think I have probably caused you more questions than answers!! Hope that gives you some more thoughts. I’ll add you to the email notification list for the hydraulics DVD. I’d like to be notified when the hydraulics DVD is ready, please. I’ll add you to the list Per. I’ll let you know when it is ready. OK David, I’ve put you on the email list. We’re putting the oil back in the tractor today and doing the final bit of setting up. Looks and sounds great. Please let me know. I have just started checking out my TO-35 and it has hydraulic problems. A Massey Ferguson mechanic in town told me that the hydraulic pump can be replaced with a newer one from a MF 135 if you are not concerned with maintaining original parts. when your DVD is available. Thanks for your enquiry, I’ll email you when the DVD is ready. You can still get all the parts you need for the TO35 pump – either a replacement pump or a repair kit. I would use a repair kit as it is cheaper! and just as good. Only thing to watch is the quality of the replacement control valve. Non-genuine control valve have a nasty habit of sticking so I would definately advise a genuine valve. Apoligies for hijacking the thread, but I had this same problem with a TE20. Turned out to be the ingnition coil that was causing the problem. Please could you let me know when the DVD is ready. I would like to order the hydraulics DVD for my mf35. Please advise when it is available. I’ve put you on the list. It seems to have taken us for ever to get the tractor back together. We had trouble with finding a replacement lift cylinder as the one in the tractor was smashed. Massey Ferguson did not have any left and had no plans to make any more so eventually we found a replacement copy part. Only thing was that the company who made it had drilled the fixing points in the wrong place which would have thrown the whole system out of allignment. In the end we had to drill and tap some new fixing points in the correct place. Although the hydraulics on my M35 seem to work ok, when using the front loader I notice that the lever needs to be almost at the stop before lifting takes place and so there is no lever movement left to alter the speed. Is this normal or indicitative of a looming problem? The rear lift seems fine and starts to lift much earlier. Hi Steve, Looks like were all after the same thing ! Enjoyed watching your engine build dvd and now waiting for this one. Plz let me know when I can have a copy. 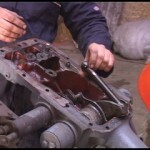 I would like to purchase the DVD of the fe35 hydraulic repair. Please advise me when it is available. I live in New Zealand and am happy to pay the extra for first class postage. Regards Charlie. ps. The DVD has now been edited and we’ve got a working copy. Sending it off to the duplicators next, so that will take about 3-4 weeeks. Hi, can you let me know when the new dvd on hydraulics is available please? Could you put me on the list for the Hydraulic DVD when it comes out. I have a MF-135 which over the past year has slowly been losing power. Also could you advise me of other products of this nature that you have. to work on and if we have the chance to film them. Thank you for the enquiry, I will email when the DVD is ready. hello steve I would like to buy the dvd hyd mf 35 is available. I would be very grateful if you could put me on your mailing list for this video. Many thanks. I’ll email you. It should be available very soon now. If it is an original 3 way valve then it may have a port marked “R”. This is “R” for return and you can pipe to that. Otherwise, the best option is probalby to drill the oil filler cap and have it threaded for a pipe fitting. However, if you do this you ideally need to have a dip tube on it so that the oil returns under the oil reservoir. This stops the oil foaming when it is returned. Make sure the dip pipe is clear of any gears and cannot come loose. Remember the gears move as you select different speeds. If i wanted to use a flow and return implement on my MF35 (a log splitter). Can i use the tipping pipe? If so, where would the return go? I have already got an isolater lever to stop the rear arms moving. Help appreciated. BTW. Dvd is great. It isn’t included in the DVD. There are 2 ways of running a loader from the internal hydraulic pump. 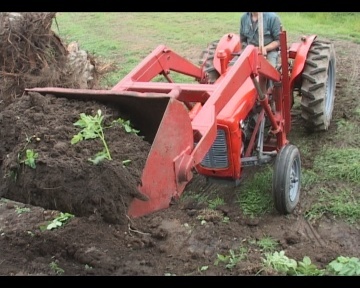 You can plug the loader into the tipping pipe and use the draft lever to operate the loader. If you do this you will need to put the T-Bar on the linkage to hold the arms up at the top, otherwise it the arms need to come up each time before the loader will lift. Other alternative is to take the cap off the top of the standpipe (under RH front side of seat) and replace it with a change-over valve (Sparex sell them). If you wish to use spool valves you can feed the vavles using either of these methods, but must also fit an oil return to the reservoir. The return should really be routed back to the reservoir under the oil level to prevent throthing. The return pipe needs to larger diameter than the supply pipe and could be fitted into the filler cap with a pipe down to the oil reservoir. I would suggest a 1/2 inch BSP return pipe. I have a MF 35 tractor with a loader that is run by a pto driven pump. 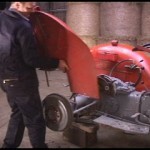 Is there a way for the loader to be used directly from the tractor hydraulics and if so is it covered in the dvd? Thanks. Pete.